Here’s a question that comes up a lot: What’s a transition state? A transition state is a very short-lived configuration of atoms at a local energy maximum in a reaction-energy diagram (aka reaction coordinate). A transition state has partial bonds, an extremely short lifetime (measured in femtoseconds), and cannot be isolated. Tip: Don’t confuse a transition state with an intermediate. An intermediate is a species at an energy minimum in a reaction coordinate, and is (in theory) isolable. Carbocations and free-radicals are examples of intermediates. In the Harry Potter series, Remus Lupin changed to his werewolf form when the moon was full. But he didn’t go from human to werewolf just by snapping his fingers: the fangs and hair had to grow, the spine curled, the hands became more pawlike and the fingernails lengthened into claws. If you saw the movies, the business of transforming from human to werewolf didn’t look like a whole lot of fun! You can imagine that the extent to which Remus disliked transforming into a werewolf was proportional to the pain involved. That point of maximum pain – where Lupin is half-man, half-werewolf – is a lot like a transition state. Like the most painful part of transforming from a human to a werewolf, a transition state is at a local energy maximum: it has partial bonds and cannot be isolated as an individual molecule. Let’s try to demonstrate what that means. 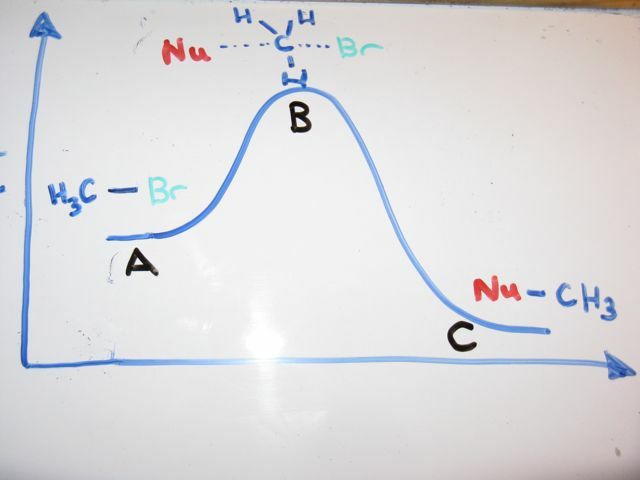 Under certain conditions, when you take a primary alkyl halide and add a good nucleophile, you end up forming a new carbon-nucleophile bond and breaking the carbon-halide bond. It’s a substitution reaction, since we’re exchanging one functional group for another. Here’s an example: the reaction between NaOH and CH3Br. You might recognize this as an SN2 reaction (nucleophilic substitution, bimolecular). Try to imagine how this is happening. You’re breaking the C-halide bond while at the same time forming a new carbon-nucleophile bond. Since you can’t have a stable carbon with 5 full bonds (it would have 10 electrons and thus violate the octet rule) here has to be some point where you have partial bonds. Since this is a pretty painful and unhappy state of affairs for both molecules involved, the lifetime of the transition state is extremely short – on the order of femtoseconds – and rapidly relaxes to the product. We have a name for this point of “maximum pain”: the difference between the energy of the starting material and the transition state (the point of “maximum pain”) is called the “Activation energy“. So given a diagram for the progress of a reaction, you can figure out the activation energy by subtracting the energy of the transition state from the energy of the product. The activation energy would be E of the TS (B) minus the E of the starting material (A). Notice another thing for this reaction: the product (CH3Nu) is lower in energy than the starting material (CH3Br). We can figure out the overall energy for the process by subtracting the energy of the product from the energy of the starting material:Energy given off by the reaction = Energy of product (C) minus Energy of starting material (A). Activation energy for reverse reaction = energy of transition state (B) – energy of product (C). 2) you can calculate the energies of a reaction (qualitatively) by examining a reaction energy diagram. what is the difference between transition state and activated complex? Transition state is at the TOP of the peak. “Activated complex” is meant to be a less specific term. It refers to the structure of the assembly of atoms around the energy of the transition state, incorporating not only the transition state but the structure at intermediate energies. It allows us to discuss the structure of the assembly of atoms that are close in energy to the transition state but not quite at the point of highest energy. What is a reactant-like and a product-like transition state. Does an SN1 reaction have two transition dates, each with a partial bond? Yes, at least two. One for the loss of the leaving group, another for addition of the nucleophile to the carbocation. How can I ‘quantitatively’ calculate energy of an activated complex? Use a program like Gaussian to model the transition state using density-functional theory. So would the “leaving group” stabilize the transition state? Or does that not happen, because the leaving group is already attached the molecule in the first place and the nucleophile is the one attacking, forming and stabilizing the transition state?